We Make Bus Charters and Group Transportation Easy! From one day bus charters to multi-day bus charters, we have the transportation experience and know-how to deliver a quality motorcoach charter experience every time. Our bus charter services are available to transport groups locally and over long distances. Plush seating, DVD players, WiFi, arm & foot rests, A/C with individual controls, overhead compartments, spacious luggage bays, and restrooms. Spacious, climate controlled, reclining seats, roomy stand-up aisle, DVD player, separate baggage & storage compartment, and large entry and exit area. 360 degree panoramic views, fully retractable convertible glass top, spacious, climate controlled, reclining leather bucket seats, USB charging ports at every seat, roomy stand-up aisle and large entry and exit area. Kelly Tours trolleys are spacious and climate controlled with a roomy stand-up aisle, ADA capability, wood interior, open air option, and a large entry and exit. 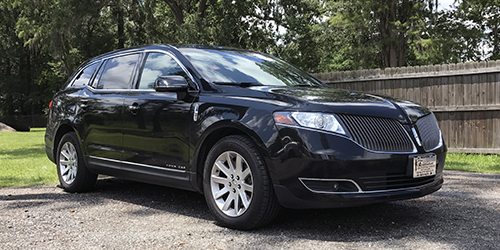 Nonsmoking, late-model, Lincoln cars offering a clean and comfortable ride, accompanied by our professional, knowledgeable & efficient chauffeurs. We’re big enough to be able to provide you with any resources you need, but small enough to take the time to listen to, and to understand the needs of our charter clients. 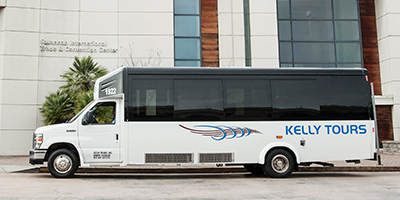 Kelly Tours is proud to be an active member of both motorcoach and travel professional organizations, as well as local business organizations. Our memberships are listed here. 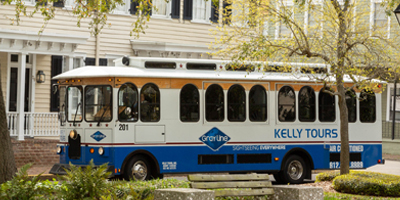 Meet the many members of the Kelly Tour’s team here. Our goal is to exceed your expectations of transportation rather than meet them. If you have an idea that is in need of transportation give us a call, we’ll do our best to make it happen. Thank you for your time on the phone this afternoon. You and everyone at Kelly Tours have always been a treat to do business with! As I mentioned I travelled with the Charleston Battery Academy team this weekend to Tampa, and I just had to let everyone at Kelly Tours know what a great job Ron Peters did as our motor coach operator! Ron always had I smile on his face and eager to accommodate our every request. He took it upon himself to have snacks available for the team and even stopped and supplied the coach with cases of water without anyone asking him to! He truly understood the needs of the coaches and athletes that he was transporting. Ron never waited to be told what to do but was always planning ahead and suggesting what our options might be. Although we were traveling with 2 teams, with 2 different schedules, he happily accommodated our every move. Furthermore, In between trips while the motor coach was parked, Ron was always busy cleaning and shining it so we would arrive in first class condition everywhere we went! It was a unanimous consensus between the team’s coaches and my self that Ron would be our first choice of drivers for future trips. Please allow me to take this opportunity to express how much we enjoyed our trip (Jan 4-6) to Asheville, NC to the Biltmore Estate. From the beginning of inquiring to see if Kelly Tours would be interested in putting together our trip to the return home I could not have been more pleased with our services. Roger Baker was more than helpful in all of my inquiries about the trip. Because of Mr. Baker’s medical leave, Shane Levy followed up on all last minutes details up to the day of departure. Joyce Grand accompanied us on our trip and is amazing. You can tell she is passionate about her job. Mark Munda was our driver and we felt SO safe with him behind the wheel. Mark and Joyce were with us every step of the way making sure everyone got off and boarded the bus safely. You should be proud of your staff. They are professional in all aspects of their jobs. OUR GOAL IS TO EXCEED YOUR EXPECTATIONS OF TRANSPORTATION RATHER THAN MEET THEM. 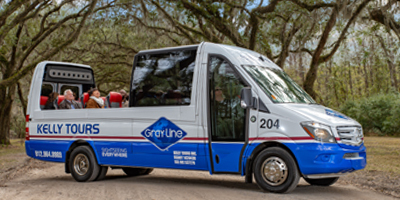 LEADERS IN MOTORCOACH CHARTER TRANSPORTATION OF THE LOW COUNTRY From one day bus charters to multi-day bus charters, we have the transportation experience and know-how to deliver a quality motorcoach charter experience every time. Our bus charter services are available to transport groups locally and over long distances. 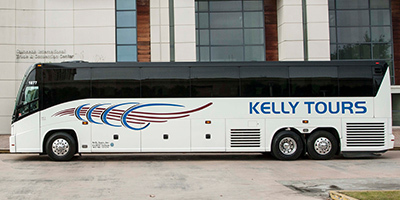 Contact the expert staff at Kelly Tours today, and see how we can help make your group travel a success! We’re big enough to be able to provide you with any resources you need, but small enough to take the time to listen to, and to understand the needs of our charter clients. For assistance in planning a customized itinerary for your group, call one of our specialists who will be happy to discuss your dates, preferences and special requests. We look forward to serving you. Together we’ll make certain that your trip is coordinated to perfection! We have many different types of bus charter clients including: CORPORATE bus charters, SCHOOL bus charters, MILITARY bus charters, SPORTS TEAM bus charters, FAMILY REUNION bus charters, RELIGIOUS TRAVEL bus charters, YOUTH GROUP bus charters and more. We are specially certified by the Department of Defense to provide charters for military personnel and their families. We’ve done our homework and are ready to help you make your next outing a success! All charter services are customized and built around your itinerary. We cater every bit of service to you and your needs. If you have an idea that is in need of transportation give us a call, we’ll do our best to make it happen. We also offer complete group trip planning services, let us book your hotel, attraction, dining & entertainment.